Now that’s cleared up we need to determine whether a hover mower, regardless of whether it’s effective or not, is for you. Typically this type of hover mower is used on slopes and banks as it can be ‘swung’ by the operator in any direction, making it ideal when dealing with areas that are hard to walk on and would be even harder to walk on with a conventional mower. So if you have a particularly hilly or uneven garden this type of mower may have some merits, however if you plan to use it to mow decent, flat areas of lawn, it’s not going to be suitable given the mess of cut grass that it will spew out as it goes. So if you’re lucky enough to have large enough garden, and you can spare the expense, it would very useful to use this mower in conjunction with a conventional wheeled mower so that you’ve got all the tools you need to tackle every area. 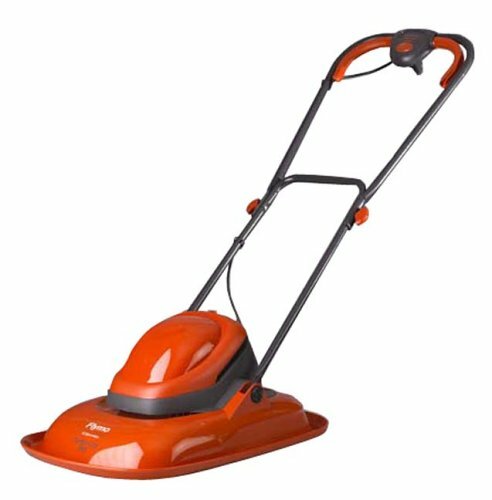 Having said that, if your garden is relatively small and you are prepared to mow it regularly, this mower could also be suitable as the amount of grass you’ll be cutting each time will be just the tiniest sliver, therefore the cuttings will be small enough to be lost in amongst the grass. So, having determined that you will have a use for a non grass collecting hover mower, what is it about this one that makes it right for the job? Well aside from coming from the most reputable name in the hover mower world it also carries a very reasonable price tag. This could make the idea of it being an ‘addition’ rather than your only mower slightly more attractive. 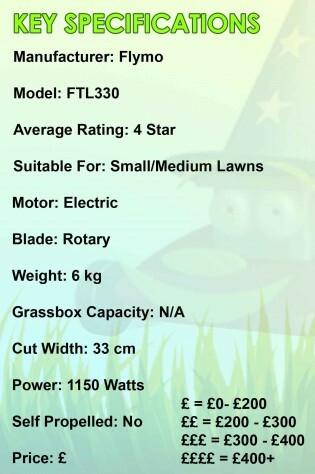 Features wise this mower has everything you’d expect, it has got four cutting heights of between 10mm and 30mm, which actually opens up the possibility of achieving some really neat and short results with regular mowing. It has a fairly decent cutting width of 33cm, which for small sloped areas or small gardens is more than adequate. It also has metal blade, which is notable as many similar mowers are fitted with plastic blades, this will have a lot more life in it and should prove to be robust for the life of the mower. 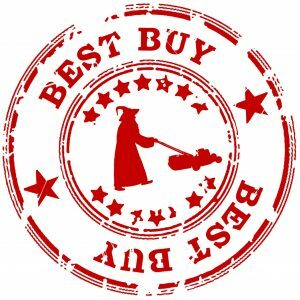 As electric hover mowers go this is definitely one of the best examples on the market, and overall it’s hard to fault this mower, it is great value for money and it handles the task that it’s designed for perfectly. It’s important to respect its limitations though, try to tackle anything too ‘jungle like’ and the motor simply won’t be able to cope.